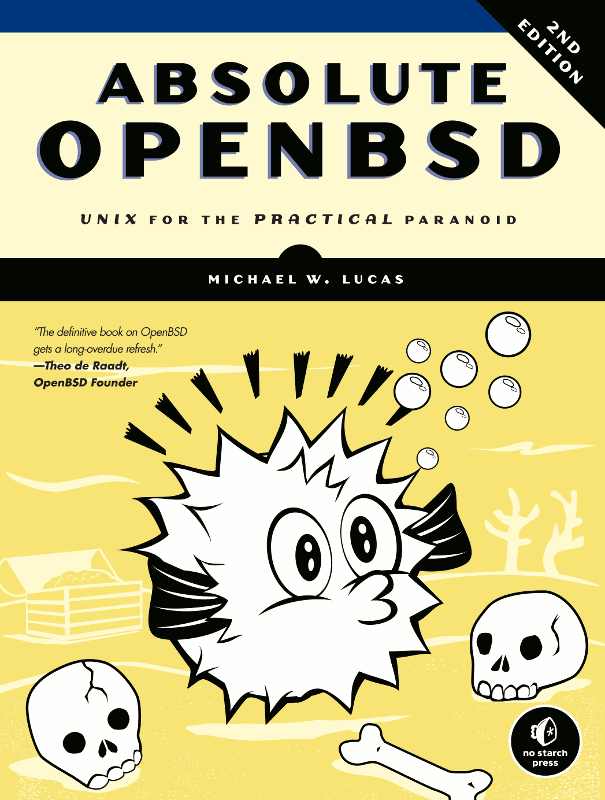 Beginning the very first 1st chapter, there's already some real world decent advice for anyone that's interested in OpenBSD, both the Operating System and community. In fact, these advice should not only apply to OpenBSD community. It should be apply to all BSD community. It's just common sense but I guess the OpenBSD folks rather spend more time on quality docs & codes then PR. I bet this is why OpenBSD is superior in docs & codes, as well as scary stories told by anyone trying to ruin it. So, for anyone that wanna give a try on OpenBSD, don't trust what you read else where, until you read AO2E. This book can offer you more truth (then myth), because it is read and corrected by some of the OpenBSD prominent developers and experts. On chapter 1 to 8, the basic stuff will get you prepared for installation & configuration. If you're good in other BSD (FreeBSD, PC BSD, NetBSD, DragonflyBSD and others), you would probably thinking skipping these chapters. Don't. The author is really good in putting basic yet fundamental facts in a humorous way. Not to mention the historical computer terms (both hardware & software) that bring back nostalgic memories. Reading these chapters will only be much entertaining, if not learning the facts. In chapter 9 - 16, and, 20 - 21, it'll be more of essential skill and knowledge that any sysadmin and developer should acquire it. Usually I would think it is straight (boring?) facts to me and I usually start flipping the pages then reading it. Instead, I finished these chapters reading every word of it. The author have a splendid sense of analogies, it fits and make it dumb easier to understand. Even the pun he uses makes one wondering "Why didn't I know this before?". Kudos to the the sprinkle of words making these facts interesting. Chapter 18 and 19 talks about kernel. It'll get you understand the "whys" and "why nots" customizing the default OpenBSD kernel. To me, this is optional stuff. But if you're a developer, this would probably a treasure to you. Chapter 18, 19, 22 and 23 are advanced topics. It covers kernel, firewalling & customizing OpenBSD. The author gave out quite a few piece of tips & tricks with advice in these chapters. The contents are covered like a tutorial, so it shouldn't be a problem for anyone to follow. Unless, you don't have the necessary understanding to the basics from the previous chapters. This book have a lot to offer. Before reading AO2E, I expect the basic facts as the default "purpose of reading", with of cause, conveying the facts and truth in an entertaining way. But the writing manner of the author making understanding the essential & advance stuff, are a pleasant surprise. Reading AO2E not only let you feel comfortable dealing with OpenBSD, it also have some best practices that every system administrator and developer should pick up. The author also stress enough that the OpenBSD documentations should always be read and deem as correct, comparing to this book. This is not only logic but also true. Having said so, it'll not be easy to follow this rule because this book make it so interesting I bet I'll refer to this book first and if I hit an error, then I'll refer to the official OpenBSD documentation. This book is indeed making it "de facto" OpenBSD reference to me. 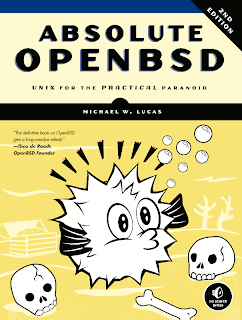 if you're interested in OpenBSD, this is the book to get. if you're looking for a book to kill some time during weekend, this is the book to get. if you're still wondering why I have such high recommendation for this book, get this book and you'll know. *** Disclaimer, I got a complementary review copy of the book from No Starch Press. Nothing else. I'm doing this review mainly in hope that Michael W. Lucas's books would sell well and motivate him to write more of these fantastic technical books. Also, I'm a big fan of Michael W. Lucas online blog (http://blather.michaelwlucas.com/), his blunt yet humorous way of conveying facts have been an interesting read. Thank you for reviewing my book! I appreciate you taking the time to write up your thoughts. Glad you liked it.